This very attractive north facing 120m2 apartment combines the best of mid century design (high stud, floor to ceiling windows, a spacious floor plan and lots of storage ) with contemporary amenities. The large sunny open plan kitchen/dining/living area has been renovated for contemporary living and has sweeping views from the harbour right around to the Tinakori Hills. There are three generous sized bedrooms one currently set up as a double study with its own external access, perfect as a home office. All bedrooms have built in wardrobes. The generous master bedroom has great sun and views. There's a luxurious bath big enough for two in the main bathroom and a separate shower and toilet in the second one. The apartment also has a separate walk-in store room - perfect if you need a wine cellar! Valuable chattels include built in bookcases and storage units. EEC light fittings, Fibre Optic cable, plus quality kitchen fittings and whiteware. The apartment also includes that rarity in the city - a double garage which also has enough room for a small workshop, your bicycle collection or for any other extra storage. The building has a seismic rating of 87%, there is plenty of visitor parking, secure entry, an onsite custodian and an expansive lawn/garden area and bush walk. 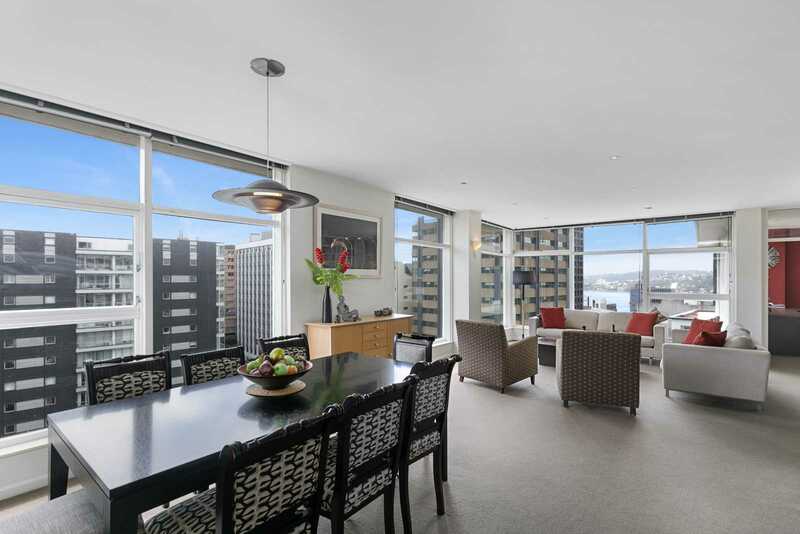 With just a short stroll to Lambton Quay or Willis Street this has to be the perfect home for inner city living. Tenure Detail: Body Corp Fee: $4,340.00 per quarter. Building levy includes rates, insurance, custodian.